The project assigned grants for 35 municipalities from seven countries in the region to develop practical measures to remove obstacles to the exercise of minority rights at the local level and provided regular technical assistance to municipalities in the development and implementation of the project, while the seven municipalities that have shown the most inspiring and applicable elements of good practices during the implementation of small grants awarded an additional grant. Municipality of Plav, the project – “Opening an office for translations”. The project of the Municipality of Tivat – “RE teaching assistant” by the Project Steering Committee was evaluated as an example of best practice in the field of inclusion of Roma and Egyptians in the education system of Montenegro, and on that basis the municipality allocated an additional grant for further development and support services established in the project. 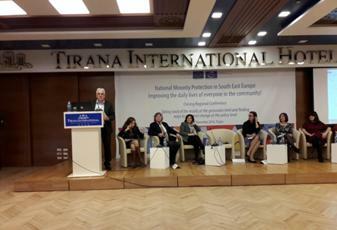 On the occasion of the completion of the project, the Council of Europe organized the final regional conference “Protection of national minorities in Southeast Europe – summarize the results at the local level and finding ways to influence change at the strategic level”, which was attended by members of the Project Steering Committee, representatives of the 35 selected municipalities, national, regional and international experts, representatives of the Council of Europe and the EU. The conference was attended by Montenegrin representatives: Mr. Leon Gjokaj, Director General for the promotion and protection of minority rights Ministry of Human and Minority Rights and Mr.Refik Bojadzic, Secretary General of the Union of Municipalities of Montenegro, as well as members of the Project Steering Committee, and representatives of beneficiary municipalities of the project. The conference presented and summarized results of the project, based on the allocated small grants, discussed barriers identified during the implementation of projects at the local level and recommendations that, based on experience gained during the project, and recommended the additional steps to improve the situation of minority rights in the national and local level in aim to be improved. Secretary General of the Union of Municipalities and a member of the Project Steering Committee Mr. Refik Bojadzic, on behalf of the delegation of Montenegro, presented a proposal of activities to be undertaken at national and local levels to implement the recommendations and improve the access to minority rights in line with European standards and the Framework Convention for the protection of national minorities (FCNM) and the European Charter for regional or minority languages (ECRML). The Secretary General thanked the Council of Europe and the Project Team on a great project that is through small grants to municipalities gave great results in terms of improving access to the rights of minorities and initiated new ideas and proposals for further work on improving the situation in this area.